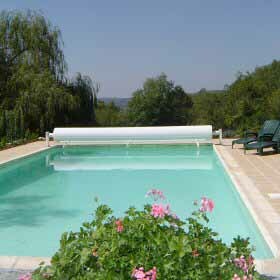 The pool boasts 13 hours of sun a day and we've just finished renovating it. It's got a brand new liner, surrounding terrace, heater for the shoulder months and leading edge pool security in the form of an electronic solid cover that seals it from infants. There are trees nearby which provide natural shade, either napping on your lounger or swinging in a hammock. The view is spectacular, the butterflies proliferate and birds of prey from the Pyrenees glide across the valley. That’s all I’m going to say on the subject as the magic is often in discovering it for yourself. If you have toddlers whose pool demands render you wrinkly; feel free to inflate the paddling pool and supervise them in the dry.